Known in Māori as Tikitere, Hell’s Gate is one of NZ’s most well-known geothermal attractions. 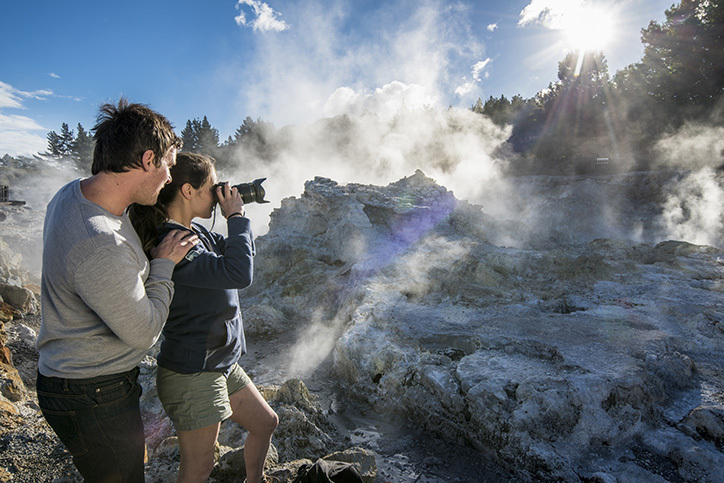 The park brings travellers from all over the world to Rotorua to bathe in the mud baths, relax in the sulphur spas and revel in the variety of natural wonders on display. You’ll find erupting geysers, hot waterfalls and mud volcanoes just to name a few – it’s easy to see why Hell’s Gate is nicknamed the “awesome beast”! Health benefits are on offer too: the black mud in the pools naturally exfoliates the skin and leaves you feeling refreshed, free from aches and pains. 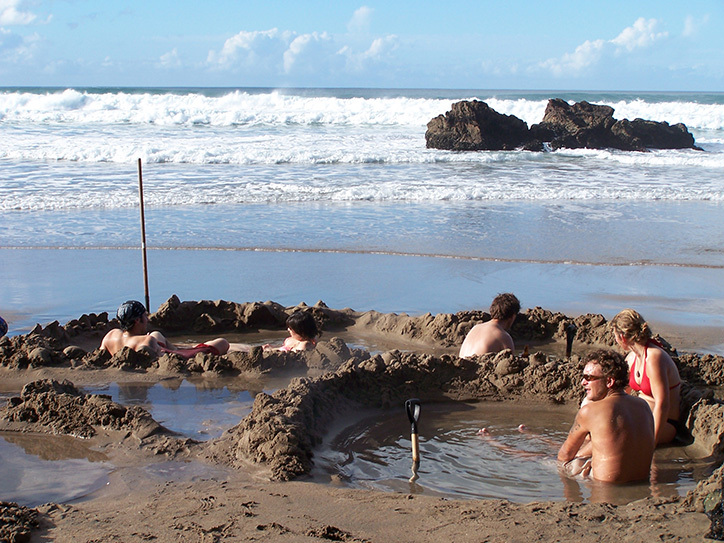 Everyone loves the beach, but have you ever created your very own hot pool at one? Didn’t think so! Hot Water Beach, as the name suggests, is not your ordinary beach; underneath the gorgeous white sand is a river of natural hot water! Hire a spade (ever done that before? ), dig your hot pool – or convince the kids to do it for you – then relax like a VIP… all without the luxury price tag of a day spa. Just make sure to visit within a couple hours of low tide to give yourself the maximum relaxation time. An unexpected wave crashing into your cosy hot pool could be a shock to the system, after all! 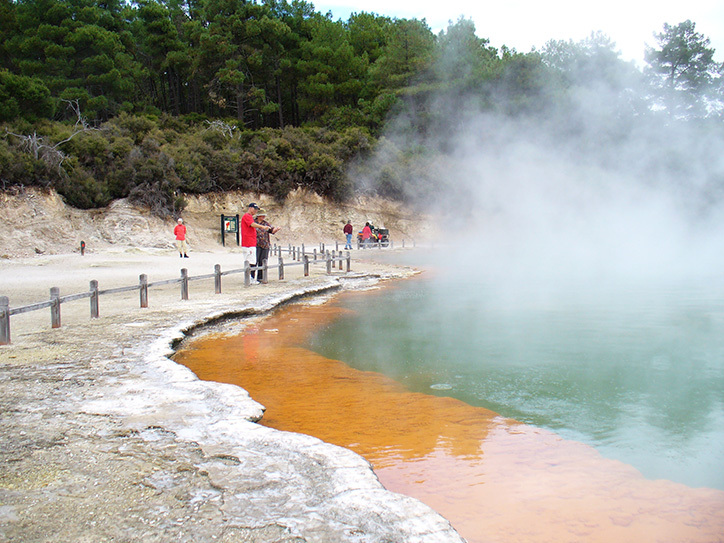 What’s the best way to see Rotorua’s geothermal attractions? On foot! 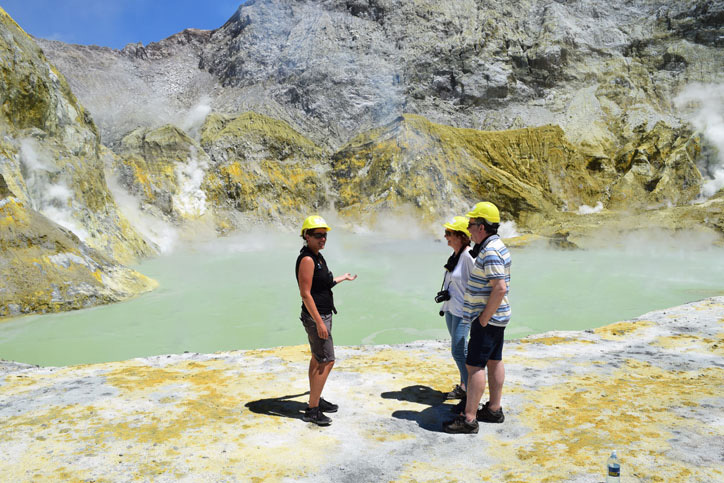 Nature Connections take you on a half-day walking tour through the home of boiling mud lakes, geysers and brightly coloured silica terraces. Walking the area provides the most immersive experience possible; the colours on show at Waiotapu run the full spectrum from earthy greys and oranges through to vivid yellow and green tones, an incredible show of nature’s diversity that looks great in photos, but even better in the flesh. Set sail off the coast of the North Island on a volcanic adventure… White Island is NZ’s only active marine volcano, and one of the most accessible volcanoes anywhere in the world. Not many volcanoes allow you to step out of a boat and onto the crater, but that’s exactly what you’ll do at White Island, where the majority of the volcano is deep underwater. The abundance of sulphur on the volcano creates incredible dashes of bright orange and yellow coloured formations. The adventure continues on the boat ride home, where you can see dolphins and whales up close. A truly unique experience and one of NZ’s most memorable day trips. Ready to heat things up? Ask us about our geothermal tours!